Ateliers Jean Nouvel has unveiled the preliminary design for the midi station renovation project located in Brussels, Belgium. 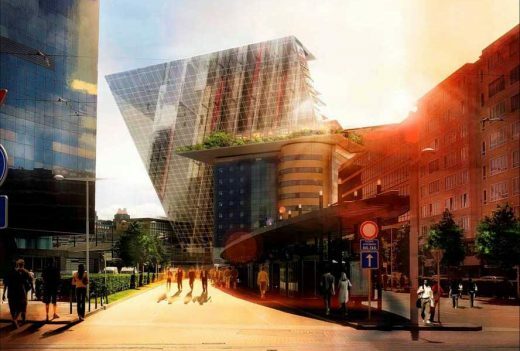 The proposed buildings will transform the existing Brussels railway station into a symbolic destination in the capital city of both Belgium and the European Union. The distinctive v-shaped silhouette emerges from the elongated base generating a prominent urban landmark. A 550 meter long facade comprised of retail, offices and a conference center will border the Avenue Fonsny at ground level. The exterior will be clad with orange-hued panels. The extensive glass curtain wall will envelope the angled facades reflecting the lively and continuous train activity into the surrounding landscape creating a dynamic urban mirror.